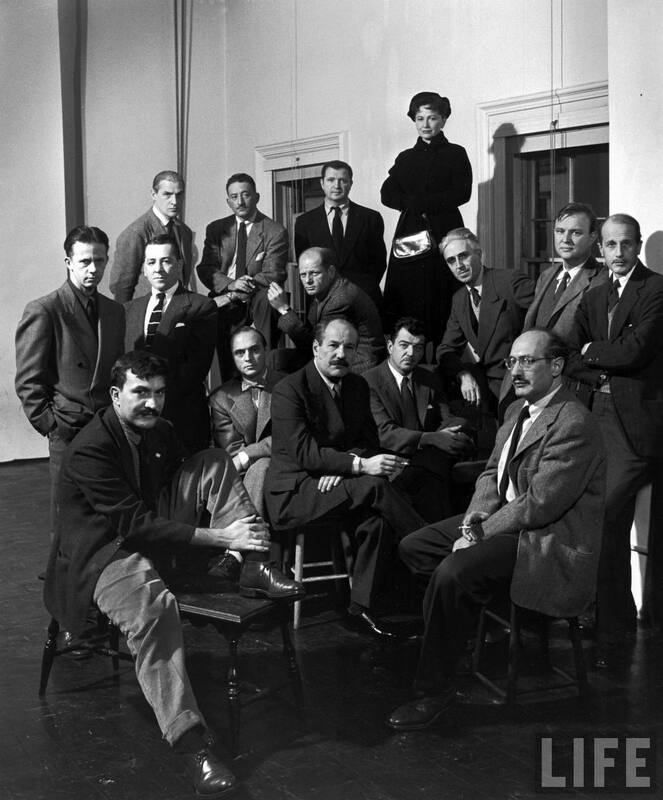 What are your thoughts on this group of 18 American artists, sometimes referred to as the Irascibles, writing an open letter to the administrative leadership of the Metropolitan Museum of Art criticizing them for being against advanced art? This stand against the prejudice modern art faces was important. Without the art these individuals created and without the struggles they had to overcome, the modern art world would be a very different place. Imagine how different the work of every artist since the 1950s would be… even how different the studio and art history courses we are taking today would be without the Irascibles. These artists placed a critical spotlight on the museum. We think of institutions like the museum as neutral places to display ideas when there are always socio-political motivations behind what is shown. I say “Go YOU!” I completely applaud that these artists would stand up for what they believe in. I personally might not agree with those views. But anyone or organization that pushes forward their ideas and goals in a peaceful way like writing the letter, I have to say it’s good. The artists deserved the right to be judged fairly and unbiased. I also think that it’s very funny that several of the museums officials could not be reached for comment. I feel its always a matter of time before we see innovation of any kind at it always faces adversity. I dont know if a letter is even needed, just do what you do and they dont want you fine. Most of these artist are going to be them from what i know of them. Maybe the letter did some good to open the eyes and help the weak minded and also give the artists a boost as well. Pollock and Rothko would have been the same i feel no matter what some letter or gallery said. Many artists of this time just rely on them own self to make art not of what is accepted. So by writing the letter might show them to f off in a sense but they are who they are. The choice to not participate in the art exhibition based on the fact that the jurors were partial to advance art seems commendable. This is a fairly large group of notable artists that does not compromise their vision and taste when it comes to their craft. On the other hand, the representatives of the Metropolitan Museum of Art might have been just cautious and worrisome of how the public will receive their kind of art. I think it is very commendable the way the artists decided to approach this. They were standing up for something they strongly believed in and didn’t want to compromise it. By sending a letter to the Metropolitan Museum of Art, the Irascibles raised the voice for future generations to have the freedom to express themselves in different ways without prejudice as well as find new artistic ways to push people’s minds. If only all revolutions could be so nonviolent as art revolutions are. Recalling the Parisian Refuse protest, the artists peacefully placed their refused paintings in their own art exhibition. It was the defenders of the status quo who hurled angy insults and threatened destructions of a new style of art they weren’t ready for. I admire those eighteen artists for being courageous and standing up for what they believe in. I think it transpired in a professional manner and that the artists who participated in the letter were nothing but honest and respectable. They basically went on strike in order to have people recognize the progress in American art and it was a brave chance. They had the choice to have their work presented in a national exhibition, but chose to fight for their beliefs instead. The irascibles are a group of artists who may have paved the way for future artists and art in America, and I think they did the right thing, without question. I think it is respectable that the artists chose to stand up for themselves and their artwork. I also think it is important for artists to stick to their beliefs, if they do not, how are we supposed to take them seriously? The Irascibles did not act aggressively, yet in a civil manner to voice their opinions. It’s always good to stand up for what you believe in and in this situation the Irascibles concerns were published and heard, however, this could have worked against them as well. Some could have viewed this letter as a ploy to guarantee such works to be included due to the publicity and not for warranted talent. In the end, I do feel that it was the correct decision and exposed the unfairness in the juror’s selection of art to be included. Excluding such works due to the lack of appreciation of the jurors would also inhibit the patrons from seeing and deciding for themselves whether they are fans and it should be ultimately their decision. Standing up to what you believe in is always the best way to go. In the end hopefully it will be in your favor. Sometimes not, but atleast you dont go back on what you believe in. I believe this group of artists are a strong group of individuals. These are people who stick up for what they believe in and are not going to let anyone take it away from them. The fact that both Mr. Taylor and Mr. Hale could not comment until later makes it clear to see that they are embarrassed and ashamed when they were confronted by a bigger group of famous artists. Thank god we had these artists in our past, not even them as just artist but these individuals who were strong on standing for their beliefs. It’s because of people like this in our history that we do not have to worry as much today. I believe these artists did the right in letting their voices be heard.They wanted to be able to show their work in an open minded environment that allowed people to come to their own interpretation about the artworks on display.I think it was inappropriate for the jurors to be hostile toward their work and therefore the right decision for the irascibles to send a letter to the museum letting them how they felt. For these were works they believed in and felt needed to be defended, as to help other artists down the road have the right to expressed their work in a professional place without criticism. I think this was an important and necessary stance, not only for freedom of expression but as a symbol that violence and aggression are not required to make change. Often, the best way to accomplish social injustice is through peaceful non-violent protest, exemplified by Dr. Martin Luther King’s movement as well as Mohandas Gandhi’s. We see it as an artist’s prerogative to freely express themselves. Without that, there is not art but censorship. I believe that The Irascibles made the right choice signing that letter because they deserve to stand up for what they believe in and be acknowledge and commended for their work alone and not compared to more advanced artists. I say, “Good for them!” They were not being treated fairly and they stood up for themselves which is not something you see every day. The subject of juries and people accepting some art but not others is absurd to me. I can see how some compositions and colors work better together than others sometimes. But I do not agree with people when they tell someone that their work is wrong or not art at all. These Irascibles deserved every respect that they could get including a fair jury. Individualism would not be much embraced and encouraged today without these eighteen artists. Thanks to them so that people become less resistant and more open-minded to appreciate when it comes to something subjective and frequently changing such as art. This letter had to be written. Perhaps the Metropolitan Museum of Art had not rebelled so much against the advancement of painting in the past, but these artists were painting in an extremely revolutionary style that the conservative juries did not yet understand. The Abstract Expressionists and Color Field painters were put under a lot of pressure in regards to the criticism they were given towards the start of these movements. The letter was a different way of them to express their ideas and feelings and to get recognition as legitimate figures in the art world. I find it strange that these people wanted to created an exhibition with art they disliked. While I commend the artists for writing this letter, I can’t help but wonder what would have happened if they had participated in the exhibition. Like Hitler’s “Degenerate Art” exhibition which ended up having a positive effect, I think the exhibition would have too regardless of the critiques of the jury. However, I think it was important to write this letter because obviously the jury and the art director are not people that had the sensibility to see that this was not right and had already made up their minds about the artwork without seeing it . The letter enabled both the jury, the art director and the public to see the irony and instead of setting themselves up for ridicule, they wrote a simple letter. An advanced art exhibition without advanced art in it. I think the fact that they took a stand, in lack of better terms, was awesome. I admire how they actually fought for what they believed was right and it is empowering to me as an artist. Advancing art will always be criticized by traditional forces, but I commend them for actually taking the time to express their thoughts. The Irascibles knew that together they had the upper hand against the so called higher powers. The letter and decision to not participate was a strategic move which enabled them to tell the public what was going on behind closed doors. Sometimes to get people to listen to your message or when you are being discriminated against it takes means by which one might rather call drastic or outrageous an any other circumstance. These means take courage and a firm belief in what you do. Obviously, the work of the Irascibles are worth fighting for. I appreciate their efforts as art should be appreciated in many different forms and styles and one or another shouldn’t face discrimination simply because it’s different. Artists should be able to express their individualism through their work and can be a reflection of the times that are constantly changing. If the advancement of art is hamstrung in any way, art may just become very one-dimensional and wouldn’t nearly be as interesting. Simply: no one can control the energy we know as art. To be an artist is a privilege. As an artist, you have to stand up for yourself and defend you r artistic integrity. Most people are resistant to new forms of art; yet imagine if this group of artists did not stand up for themselves? Art History as we know it would not be the same. Now days, artists are content in doing most things alone. Artistic movements are not what they used to be. However this can change if we as artists stop seeing the great separation of the differences in mediums. We need to remain assertive and continue to invent; never backing down to the notion of being silenced nor censored.